IFA chief executive Patrick Nelson says a proposed £36m programme of investment in local football grounds has the potential to revolutionise the game in Northern Ireland. Sports Minister Caral Ni Chuilin has announced a 12-week public consultation exercise into the plans. 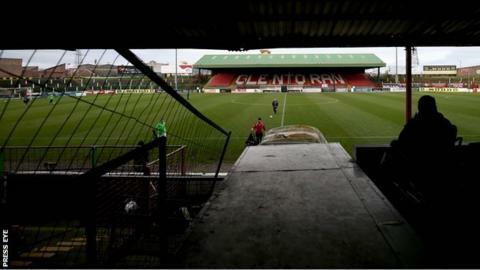 They include a £10m redevelopment of Glentoran's Oval venue in east Belfast. "This is a good day for football. I'm aware that clubs have waited patiently for this day," said Ms Ni Chuilin. The consultation document published by the Northern Ireland Executive's Department of Culture, Arts and Leisure includes proposals for the funding of projects across five separate strands, ranging from intermediate and junior level to the senior game. "I would encourage all interested parties, including football clubs and the wider public to have their say, to fully engage and submit consultation responses," added the Sports Minister. "The last decade or so has witnessed a marked improvement in the enhancement of stadia following years of historic underinvestment and it is important that a broad range of clubs have the opportunity to benefit." IFA chief Nelson said the availability of £36 million was a further landmark commitment to the sport following the Executive's funding of the new international stadium at Windsor Park. "The Irish FA will engage fully in the consultation and will be using our Facilities Strategy document, published in 2012, as the basis of our submissions to government," said Nelson. "This document was prepared by the Association following eight months of research and consultation with clubs at all levels and stakeholders right across the country. "It is my hope that this research, which advocates funding developments at all levels of domestic football and the provision of a new National Training Centre, will help inform any decisions that will be made by the Minister in the coming months."